The HTC First smartphone is checking in with an almost free price on U.S. carrier AT&T, as poor sales speculation for the Facebook phone has mounted. "The HTC First price drop is a current promotion that AT&T is running both in stores and online," a spokesperson for the carrier told TechRadar. "HTC First will be $.99 on [a two-year] contract,"
"We do promotions like this all the time. (i.e. Lumia 920 is currently free in some channels)." That sounds reasonable, only the Nokia Lumia 920 came out for AT&T in November. The HTC First with Facebook Home launched on April 12 - less than a month ago. While HTC and AT&T wouldn't comment on the First's sales information, calls to individual AT&T stores backed up the poor sales speculation. "People don't seem to want that phone as much," an AT&T sales representative said, echoing his other colleagues when asked about the sudden price drop. The performance, they said, is being affected by other phones people do want, namely the iPhone 5, Samsung Galaxy S4 and HTC One. "The HTC One just came out," said an AT&T employee at a different store of the flagship phone, which starting rolling out in the U.S. April 19. "So whenever they come out with a new phone, the price of the older one usually goes down." With its mid-range specs and 5MP camera, the HTC First seems to have had a tough time closing the deal at $99 (around UK £63, AU$97) when sitting next to the higher-end HTC One. However, the phone's new, almost free status could spur the avid users of social networking to try the Facebook Home experience running on top of stock Android 4.1: Jelly Bean. "We think this is a good move by AT&T and have highlighted the new price on our Facebook Mobile page," a Facebook spokesperson told TechRadar. No company would comment on just how long the promotion will last. 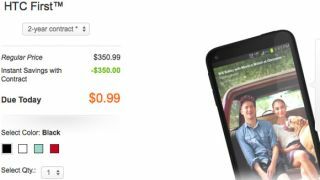 "For competitive reasons, we can't speculate on timing [of the $.99 promotion]," said an AT&T spokesperson, a price that works out to about UK£.64, AU$.97). All of that may depend on how well HTC First lives up to its name on consumers' priority lists.